This game has seen two major German editions - we played the newer edition which is slightly different from the old "Flying Turtle" edition. The game has many similarities to "Acquire" - players compete for shares of companies which are constantly growing and competing with each other. Each player starts with zero capital and tries to gain as much money as possible by selling stock at the right time, and keeping other stock when it's worth keeping it. There are 4 companies that can be "acquired", at the beginning of the game no company is present on the board. On his turn the moving player rolls two dice. The first die indicates which company is placed for the first time (or enlarged) on the board, the second die indicates in which zone the company pawn is placed. There are four zones and a "shark" zone in the middle. The shark zone has a higher probability so the companies tend to grow towards the middle, where they will most certainly meet (more about that later, the game is not called "Shark" for no reason, folks!). There is 2/6 chance that you can determine which company you can place, so the actual probability for the company you want is 50%. The first pawn placed sets the starting point of this company - it is now worth 1000 $. The player who founded the company now gets 1000$ in cash and can use it to buy shares (you can only buy shares of companies that have been founded already). Later in the game the company can be enlarged by placing a pawn next to it orthogonally, like in "Acquire". The player placing the new pawn gets the value of the new size of the company in cash AND every player who owns stock of this company gets an amount of money that reflects the growth of the company (for example if it grew 1 pawn from 6000$ to 7000$ each stock pays dividends of 1000$. How can it grow two or more in one turn, you may ask? It is possible to found a sister company of the same colour instead of enlarging the original company. This new company will be worth nil at first, but if a second pawn is placed these two are added to the original company's worth, which will now give 2000$ per share. If you connect two originally solitary pawns with a third one you might even raise the company's net worth by three! Enlarging companies works towards the end of the game - if any company reaches the total size of 15 the game ends! What happens if companies meet? Of course the larger one destroys the smaller company although there is no other benefit. The owners of the destroyed companies stock have to pay a kind of fine though, an amount of money per share that is equal to the devaluation of the destroyed company. A company might even fall back to zero worth, which usually means that it won't have a future (although of course you can found it again, like in "Acquire"). A special rule allows the "destroyer" of the company (the player who played the adjacent pawn) to survive this disaster unscathed, even if he owns stock of the destroyed company. Each turn a player can sell as much stock as he likes, either before or after rolling the dice. Usually it is better to wait, as you might be able to enlarge the company you want to sell before selling it! He can also buy a maximum of 5 shares of any existing company, also before/after rolling, in any combo. We played with the highly recommended rule of limiting the companies to the value of 7000$ (regardless of how large they are). This means that you have to found sister companies to reach the maximum of 15000$ net value, which makes the abstract boardgame part of the game much more interesting (otherwise it would just be a dice rolling competition between 4 gigantic and growing mega corporations - it would rarely make sense to found sister companies!). How does it play? Like "Acquire" this is an easy and quick playing game with a lot of tension. The luck element is considerably higher, though. Any strategy you might follow is dependent on the roll of the dice, so it is always wise to watch the stock market meta-game closely. Especially with many players it can happen that the board make-up changes so rapidly that you cannot react to the destruction of your favoured company and suddenly find yourself paying heavy fines! The steep money acquisition curve is also a factor: You begin the game with nothing and usually need around 300.000$ to win. Falling back and not being able to invest only one round already ruins your chance of winning, as the winner is usually the person who makes a profit every round and invests to the max in the right stock. This is a problem I find apparent in the highly sought "Outpost" as well - a few mistakes and even a bit of bad luck in the first 2 rounds can already make the game impossible for you to win and you just watch the distance between yourself and the others grow and grow. Whereas in "Acquire" you can actually be on the winning side if the company that you own stock in is "eaten" at the right time, having stock in a company that is being destroyed in "Shark" is always bad news. Therefore the suspense factor is higher, which is one of the plusses of the game. But still, "Acquire" is the more perfect game, and "Shark" might only be recommended if you want to play a lighter, slightly quicker and more aggressive "Acquire" variant. Still, it is very cheap at the moment - Aaron bought his copy for 5,-EURO! So if you come to Essen this year you might want to check out the local mall for a give away copy. It is by no means a bad game but left an average impression. 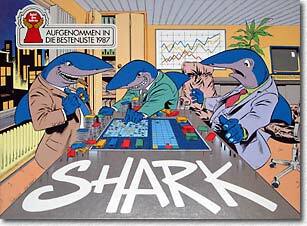 The business game "Shark" is a lighter variant of "Acquire", with some different twists and a more aggressive playing style. These strategy tips assume you play the "limit to 7000" growth rule of the old German "Flying Turtle" edition. "Shark" has a definite beginning, middle and end game. Buying stock should reflect the special needs that apply to each game phase. It is of high importance that you never miss an opportunity to invest in this game, so you need a steady cash flow. Missing out even only one turn of possible investment usually makes you lose the game. There are only 4 companies in the game, and in the beginning of the game chances are that they all will be developed at least to a size of 3. So you should buy as many different kinds of stock as possible, to be on the receiving side whenever these companies are enlarged and pay dividends. All companies start out being worth 1000 $ and can go up to 15000$ so at the beginning every 1000$ can make a difference. 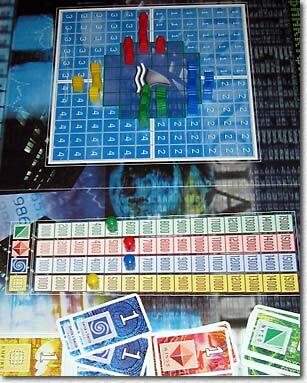 In the middle game you should watch the board closely and decide which companies are better competitors than the others. You should make a definite plan of letting one kind of stock go, although you would be best advised to keep the most popular ones and sell the most unpopular one. You will definitely be forced to sell stock in the middle game, to get an edge in the cash flow over the other players. In the end game it is likely that only one or two companies will be serious contenders for the win. Concentrate on one company only (if there is any chance of it surviving), and sell the other stock aggressively. Don't be scared to buy stock at high expense - if there is still a margin for it to grow it may well be worth it. It is again usually best to keep to the stock that is most popular and most widely distributed, so it has the least chance to be dumped. If you gained an edge through selling stock in the mid game you will have an advantage over the other players. Recognizing the winning stock as early as possible is very important, but you will have to be lucky as well. If one player is the leader in owning a particular kind of stock and you feel you can't surpass him anymore you can perform this manoeuvre, if you see a chance of destroying his company in a small number of steps on the board. Wait for your dice roll and place a pawn that begins a tendency that could lead to the possible destruction of this company on the board. Then sell it - all of it. You don't have to do the killing move yourself next round, but chances are that the other players who own this stock will dump it as well, scared by your shock tactic, therefore seriously threatening your contender (who might end up selling his stock himself!). They will also be more likely to use their dice rolls AGAINST the company they sold - which is also to your advantage! Of course this tactic can be used against you, and the more players there are the more unforeseeable it is. Generally I think you should not be the leader in any stock during the game, only in the end game should you try to surpass everybody else for maximum profit. Being slightly behind the leader in a stock is usually a good tactic. "Shark" has a very steep money earning curve - you start with zero and have to earn around 300.000$ until the game ends. This means that any wasted opportunity to make an investment is a grave mistake. Ideally you should use all your money to buy stock, and you should invest in a way that you always have money to buy stock (see above). Of course there's the limit of 5 shares. It is always tempting to buy the cheapest stock, but sometimes you can gain an important edge by buying stock that others can't afford. It doesn't matter if you buy 1000$ shares that later go up to 7000$, or 7000$ shares that later go up to 13000$ - the net profit will be the same. But you might gain an advantage in shares that others won't touch because they are too expensive for them. It is the most important and blatantly obvious tactic in this game: Invest every penny you have, reap benefits every turn. When the player directly to your right enlarges a company and buys shares, you might do that as well. Chances are good he won't dump them immediately next turn. Try to buy a few shares less than him; it is not always good to be the leader in shares (see above). Buy some other good stock instead. Be versatile, especially in the beginning. I often oversee this important point - very often you will have a choice to place the pawn on several different spaces. If you want this company to later expand you should place the pawn in a way that makes the chance of another pawn being placed next to it higher, for example placing it on a space that is next to more than one of the 5 zones. If you are not able to expand the company next round, you might be well advised to place a new single pawn in a way that it touches even more zones, thereby heightening the chances of expansion even more. Of course the opposite applies if you don't want the company to grow. You might be tempted to invest in companies that are not the biggest company on the board. 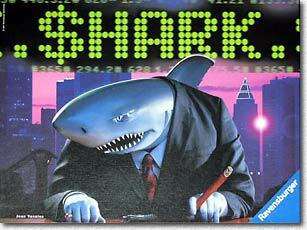 But "Shark" is, as a game, not really that clever. If there is a monster company on the board, and if it is the largest company out there, chances are it will become larger and larger and destroy other companies. This is really a no-brainer. You should never, NEVER sell stock of this company, because it will definitely grow and most probably survive. There is no mechanism that endangers the largest company apart of a string of freak rolls that suddenly make a nearby company bigger. Of course the "limit to 7000$" rule makes things a bit more complicated, as "winning" companies will definitely have to spread thin to gain net value. Most of the time though it will be very obvious which companies are going to survive and which not. Go with the obvious, or with the majority, if in doubt.